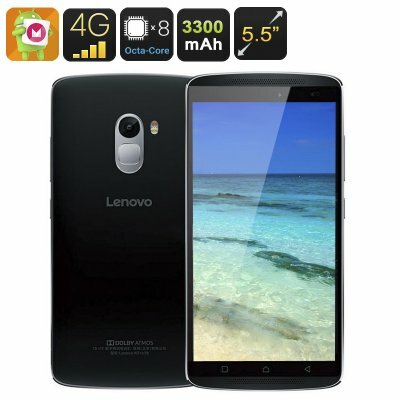 Successfully Added Lenovo X3 Lite Smartphone - Octa-Core CPU, 1080p FHD 5.5 Inch Display, 3300mAh Battery, 13MP Camera (Black) to your Shopping Cart. The Lenovo X3 Lite lets you enjoy a magnificent user-experience yet comes with a remarkably affordable price. With its sleek design and 5.5 Inch 1080p FHD Display this Chinese smartphone displays vivid colors and brings all media to life. Enjoy a true cinematic experience from the palm of your hand, play the latest games, or snap and share magnificent pictures thanks to a 13MP camera – with the Lenovo X3 Lite your possibilities are endless. Equipped with a powerful Octa-Core CPU, 2GB of RAM, and the Mali-T720 GPU this cheap Android phone packs some serious power. Capable of dealing with all your multi-tasking demands the Lenovo X3 Lite offers you a perfect platform for entertainment and business alike. Browse the web, watch your favorite movies, or play the latest and most demanding mobile games – this Chinese smartphone is capable of handling everything you throw at I without dropping a single frame. With up to 128GB of external data you are free to download what ever media you feel like from the Play Store without ever having to worry about storage space. Insert two SIM cards and enable them simultaneously thanks to its Dual-IMEI number. With the possibility to connect to two 4G network providers at the same time you can be assured that you will always stay connected and stay up to date about the latest happenings. Ultra-fast fingerprint technology allows you to unlock your device in the blink of an eye without the need to ever again remember those bothering passwords and access codes. Additionally, this cheap Android phone has been equipped with a stunning, professional-grade, 13MP camera that lets you snap and record all those unforgettable moments in life in breathtaking detail – ensuring that not a single moment in life will ever be forgotten again. un poco atrasado pero en perfectas condiciones y muy lindo!